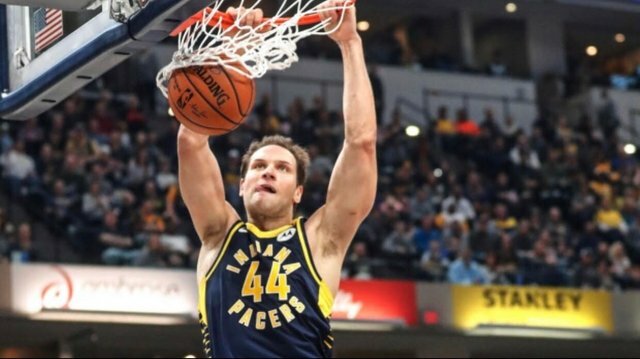 I don't know if you guys have heard, but a big reason the Indiana Pacers have stayed afloat in the Eastern Conference without Victor Oladipo is that their man Bojan Bogdanovic can light fools up. You know, the guy that looks like he should come over to repair your fridge, not lay up 30+ on multiple teams in the National Basketball Association. Bojan is a 6'8/9 small forward from Croatia who can absolutely shoot the hell out of the ball. On the year, he's averaging 18.1 pts,4.1 boards, 1.9 assists, and .8 steals while shooting 50% overall and 43% from three. Those are great shooting numbers in general, but since the All-Star break he's upped the ante to 22.5 ppg, on 51.8 FG% and 44.8% from three, He's 29 years old, currently making $10.5 million and facing a summer of unrestricted free agency. Some smart team is going to give him a yearly figure close to $20 million. Since Dipo went down, the Pacers had no other choice but the "next man up" strategy. Bojan found the ball in his hands more often in pick and roll situations, and instead of faltering under the heavier usage he thrived. On March 7th, Kevin O'Connor of The Ringer reported that Bogdanovic went from 1.4 to 3.4 pick and roll possessions per game post-Dipo. 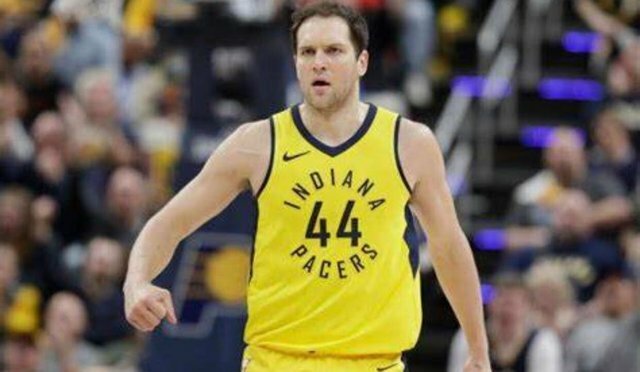 Everyone expected the Pacers to immediately fold, but Indiana managed to hold their own with a 10-8 record during that span under the guise of their new game manager Bojan. The Lakers tried zigging while others zagged last off-season. Instead of surrounding LeBron with his typical lineup of floor spacers, the purple and gold recruited alleged, "tough-minded facilitators". Well, they should give zigging a shot this year, and prioritize a guy who can boost both LA's 29th-ranked three-point accuracy (33.2%) and free throw percentage (69.8%). 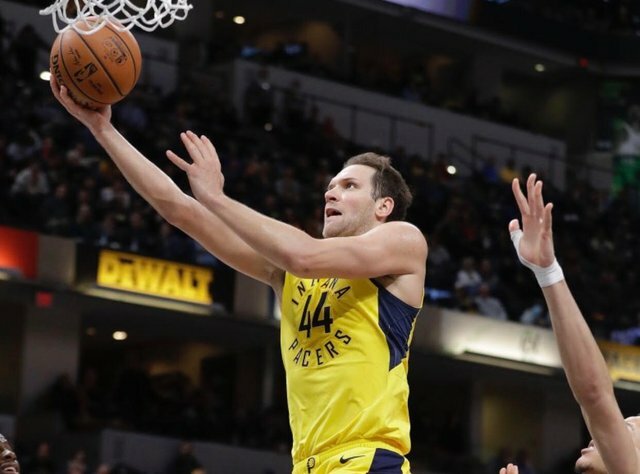 Bogdanovic won't regularly wow you with LeBron or Lonzo-esque highlight passes, but he won't do stupid things with the ball in his hands either. 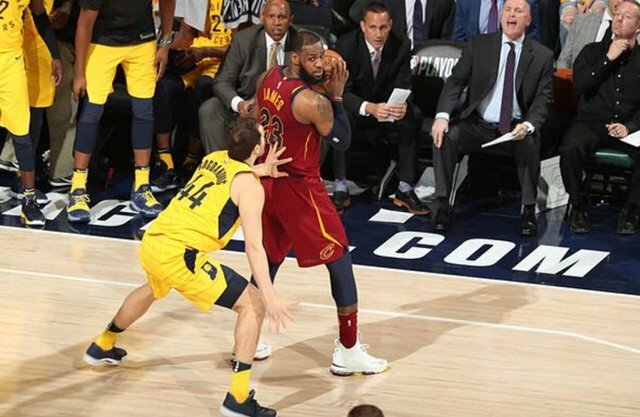 Replacing a ball-dominant guy like Rondo or Lance with a guy of Bojan's skillset will free up ball-handling opportunities for Bron and Zo - the guys who should be controlling the rock. However, if injuries arise again like they did this year, we already know he's adept at leading an undermanned team with his pick and roll prowess. Los Angeles has tried swinging for the fences in every summer since Dwight Howard left. It was an exercise in failure until LeBron James showed up, but you could argue that he came for long-term reasons outside of basketball. Since it's a superstar's league, the goal is to pair him with another star-level player, but a third, B-tier guy like Bogdonavic, is necessary to truly contend. Once the dominos of the top free agents fall, that'll dictate who needs a small forward who can shoot. Small Forward, along with Point Guard, seems to have the most superstars at their respective positions these days. Because of that, guys like Bojan fly under the radar. The Lakers are already stuffed at Small Forward with LeBron James, Kyle Kuzma (sort of), and Brandon Ingram, but Bojan can slip into Shooting Guard or small ball 4. If the young forwards get dealt for a star, or the Lakers strike out on bigger fish, then Bogdonavic could be a diamond in the rough. Let's hope the Lakers front office takes a long look in the mirror and owns up to last summer's roster building mistakes. It's a shooters league and you have LeBron - don't overthink it. You received more than 930000 upvotes. Your next target is to reach 940000 upvotes. I'm curious. What is your relationship with SteemAuto.com?